Presumably in homage to the host city, Darío del Moral, the synth player (he later strapped on a bass), wore a t-shirt sporting Peter Saville’s monochrome art-work for Unknown Pleasures. We can argue about the play of dark and light forces in the music of el Niño de Elche, but there was a sense of occasion that no-one present will soon forget. The concert was both an exemplary exercise in catharsis and a brush with immortality. Most people were expecting the Gypsy Kings. It isn’t that el Niño de Elche sings protest songs, it’s more that he’s somehow receptive to the pain generated by evil acts throughout the world, and transmits the intensity and rage through the medium of a powerful voice trained in flamenco. Of course, the transmission of rage is what flamenco has always done, but this is duende on a cosmic scale. And because suffering has no words, so el Niño resorts to shrieks, gasps, moans and, finally, a sustained scream. His body is subject to a paroxysm of jerks, but his hand movements are graceful. This is telling, and somehow symbolic. He has something in common with Phil Minton, the great non-verbal articulator of the visceral, and, as we know, with Ian Curtis, who took the sins of the world on his skinny shoulders. But perhaps I’m not adequately conveying the charisma and humour of el Niño de Elche. One song, ‘Nadie’. – “Nobody knows me / Nobody has discovered me yet / Not even the artichoke of my shower” (this free translation comes from Eva) – has him chuckling away, taking the audience into his confidence and exposing the psychosis that lurks behind charisma and humour. In short, he’s a consummate actor as well. There was a comic note too, when Raúl Cantizano exchanged his axe for a Spanish guitar (at last, flamenco!) modified by two tiny fans whose whirling blades recreated flamenco’s rapid thrum by mechanical means. The song was ‘Canción de Corro del Niño Palestino’, where suffering quickly outstrips the power of words, and the laughter soon died. I shall go and live in Madrid if only to hear again the passion and sincerity of el Niño’s performance. 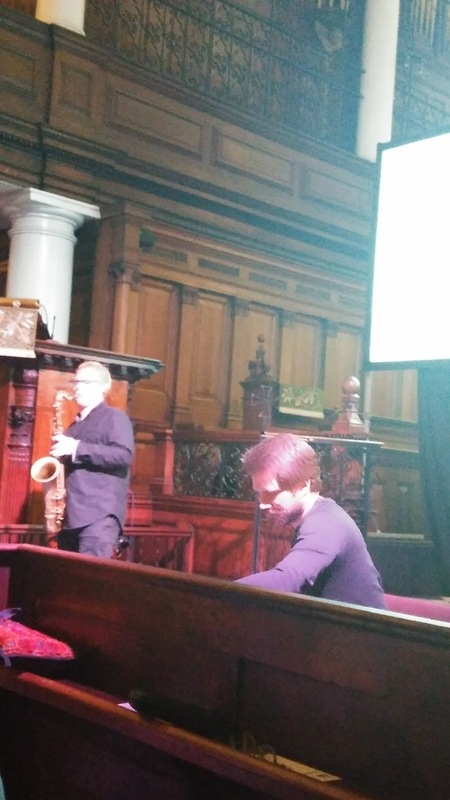 For the Vyamanikal project, Kit Downes and Tom Challenger decamped to rural Suffolk to explore the acoustic properties of old churches, with Kit Downes extemporising on pipe organ in a reedy sepulchral way, and Challenger responding with a minimal, keening saxophone. Singularly responsive to the spirit of place, the music was unique and full of character, and turned on the peculiarities of oft-neglected, wheezy old instruments. 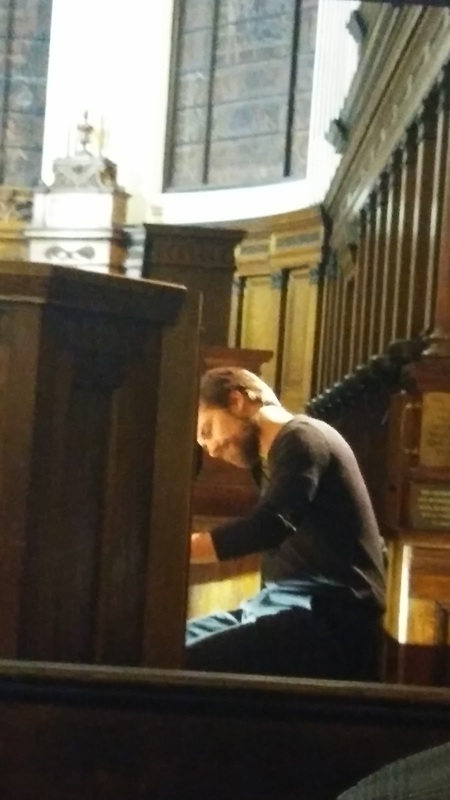 Extending the concept to historic St Ann’s Church in central Manchester is an interesting idea, though this sacred space is rich and ornate and the church organ is well maintained, with some original pipework from 1730, when it was built. Tantalisingly, Downes mentions that his father learned to play on the very same instrument. Downes is drawn to the subtleties of timbre and texture and extracts a thin, shifting sound; more misterioso than pomp. It’s music that evolves in a natural organic way, however, and these are just quiet beginnings. Challenger complements with plangent simplicity. 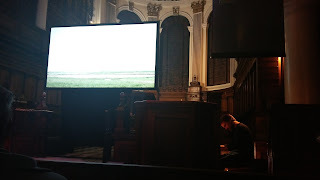 A screen just behind the players shows visuals of eerie flat expanses and cornfields, presumably from the same Suffolk wilds. This invites comparison to the old BBC Christmas adaptions of M.R. James ghost stories, but it's all a bit literal: it seems a shame listeners can't be trusted to make the connection for themselves. Downes temporarily diverts to a small harmonium with very much the same tonal register. 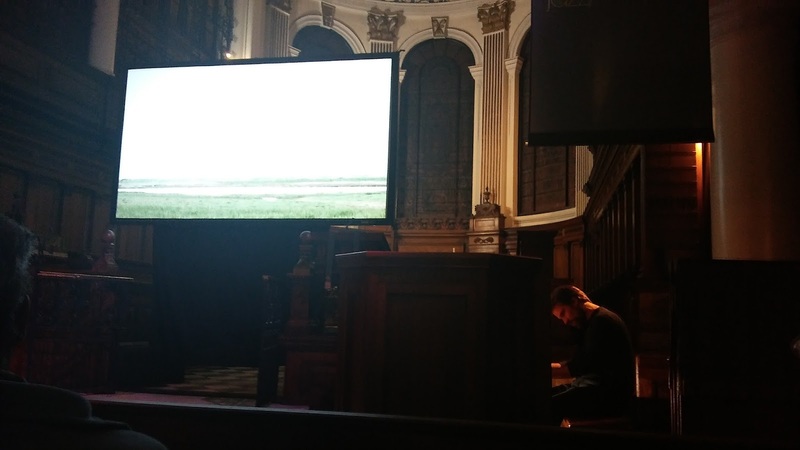 We’re told that the music is fully improvised and there is no reason to doubt it, but it seems very purposeful in its meditative way, and the interplay between the two players is confident. It hardly seems necessary to say that the sound is extremely haunting. Applause would only break the spell. Finally the organ regains some of its conventional power, and events take on a more grand guignol aspect, as if Count Magnus has arisen from the tomb. No, that’s a rather reductive characterisation (you see how sensational the unfettered imagination can be). Say rather that the music evokes the circle of life and death, and is more gratefully life-affirming than gloomy. Let’s Get Deluxe is the title of the new album and an unnecessary statement to apply to The Impossible Gentlemen. They can’t help but get deluxe. Unfailing quality is a given. The tune opens the concert – something of MJF veterans, this is their fourth appearance under that banner – and it slips down like a treat: high-calibre jazz funk, effortlessly sustained by guitarist Mike Walker’s joie de vivre. Though capable of emulating the immaculate polish of a Crusaders or Steely Dan indefinitely, the Gentlemen opt for different colours, different moods. The second tune (sorry, I didn’t catch the name) is more cussedly prickly; ‘It Could Have Been a Simple Goodbye’, dedicated to John Taylor, is an opportunity for Walker to wear his heart on his sleeve, always gratifying to behold. The central Impossible partnership is between Walker and the pianist Gwilym Simcock and how the latter’s virtuoso, slightly academic muse has been tempered by Walker’s warmth! The dazzling gaucherie has been laid aside in favour of something that swings, and, though capable of chopping time with the precision of an atomic physicist, he restrains himself from doing so. ‘Dog Time’ starts with Mike in ominous free-form and climaxes with exultant baying, with sinister stalking in-between. There’s a cinematic component to the band as well, offering soundtracks to non-existent movies, with listeners in the role of cinematographer. ‘Dog Time’ is clearly a spaghetti western, with a full cast of desperadoes and badmen. 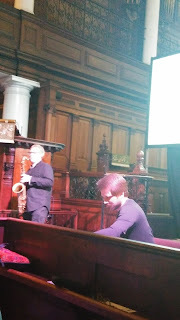 The addition of Iain Dixon’s saxophones (and occasional keyboards) adds to the expansive sound. He plays with confidence and can vie with Walker for tenderness. Drummer Adam Nussbaum swings the band with considerable power, but his chief asset is to mix unbridled power with delicacy. On ’Speak to Me of Home’ he gauges the intensity with precision. Do we miss Steve Swallow? With respect, we don’t, not when bassist Steve Rody holds the centre with such unruffled authority. He’s a conventional time-keeper of immaculate clarity, but then clarity is the sign of a Gentleman. ‘Barber Blues’, graced by a little fugue between Simcock and Walker, slips into a drum solo by Nussbaum, interrupted by a trick coda that catches some of us out. These guys are playing games with us. ‘Propane Jane’ locks into a solid groove and, again, Mike Walker lights up the night. A true guitar hero, Walker’s trajectory from macho swagger (don’t knock it: swagger is Manchester’s great gift to music) to paragon of warmth and sensitivity is one of the great jazz stories. 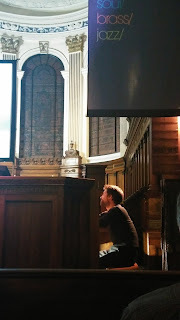 ‘Clockmaker’, reserved for the encore (and written for Iain Dixon’s dad, Walker reminds us) is something of a Greatest Hit, and an eloquent expression of joy. Technically, Wishbone is Zoe Kyoti’s solo debut, but there’s a familiarity about the songs, an aroma of Greatest Hits, which can be explained by the fact that some are much-loved in stripped-down versions by Zoe’s occasional string band, The Magic Beans. ’Monsoon’, with two previous incarnations – on The Magic Beans’ debut and Matt Owens’ album, The Aviator’s Ball – has achieved the status of a classic by now. Here powerful nature becomes a metaphor for the necessity of letting go to achieve selfhood, at whatever destructive cost. An ecstatic hymn to bliss, and deeper than anyone suspected, ‘Monsoon’ opened the floodgates to Zoe’s creativity. All the songs on Wishbone are self-penned or co-writes, and constitute a defining statement of the Kyoti aesthetic. 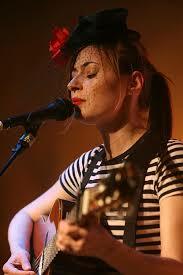 She has a very feminine capacity for finding fresh personalities to inhabit with every song. The title track blends sensuality and restlessness in a very winning way. ‘Don’t Spend Your Love On Me’ comes close to uncovering the scam on which mass entertainment is based (it’s as if Dusty Springfield admitted she didn’t only want to be with you). In ’My Evil Soul’ Zoe play-acts the femme fatale with great gusto (to sweet Hot Club guitar licks from Uli Elbracht), but the demons are real on ’Old Rope’. Zoe loses all inhibitions in this especially sombre song, relieved only by a neo-psychedelic chorus. When it all gets too dark, she can always return to unabashed beauty, of which ‘No Way Back’ and ’Anything You Can Dream’ are prime examples. But it seems that prettiness is no longer enough for Zoe Kyoti. Seductive charm comes easily, and her ability to enchant and beguile is a given. Yet Wishbone is interesting for the way the desire to please co-exists with hints of depravity and malice and just enough dark side to exude a heady sense of danger. This of course, makes Zoe more attractive than ever, and so we come full circle.